Jean (Scott) Price was born in Wichita, Kansas, on June 16, 1929, and attended segregated schools from the first through eighth grades. She then attended the integrated North High School. For a short time she lived in Kansas City, Kansas and attended the segregated Sumner High School. She graduated from North High School in Wichita and later on from Wichita University (now Wichita State University) with a degree in teaching. She also received her master's in education from Emporia State. After moving to Topeka in 1956, Price accepted a job at the Parkdale School where she was the only teacher of African-American descent. After the Supreme Court declared segregated schools unconstitutional in 1954, Parkdale became integrated. She also taught at the Lowman Hill School. According to her interview, she generally got along well with her students' parents and school officials, even though some were opposed to desegregation. The interview was conducted by Jean VanDelinder. 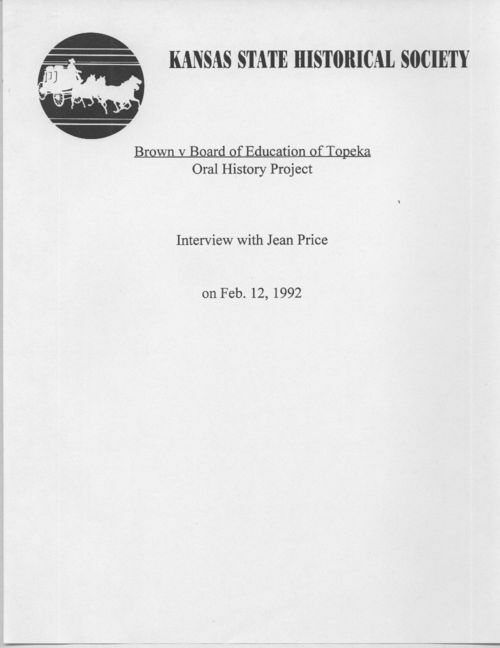 This source provides the perspective of a black educator who was effectively integrated into the Topeka school system. It could be grouped with a variety of sources related to integration, such as the newspaper article that discusses how desegregation had an impact on black teachers.